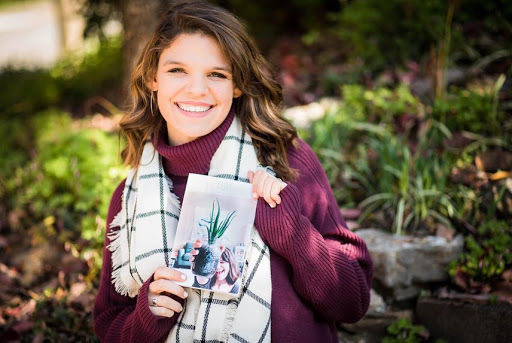 Abigail Sorrow (’21), a current English major at Covenant, intends to release her self-published book “Full” on Sunday, December 2 on Amazon. I sat with Sorrow in her cozy, dimly lit room as she sipped coffee to talk about her book. Behind her, the crystal blue mountains peaked in the distance from her dorm room on Fourth North in Carter. Sorrow began explaining to me how writing has been an outlet for her when dealing with hardships in her life and throughout her struggle with depression and anxiety. But she had not considered ever publishing her work or having writing become her career until she was in high school. This book is the beginning of many writing projects Sorrow hopes to tackle in the future. Sorrow explained to me that she began “Full” during her senior year of high school after going through a struggle where she did not fully lean on and find her identity in the Lord. “It’s about seeking fullness in Christ, which is something I hadn’t been doing for a long time,” Sorrow explained. During the fall of her senior year of high school, Sorrow read the book of Ecclesiastes, which she described as being one of the first books of the Bible she has sat down to read and really understood. This book became one of the key influences for her own writing. She felt as if she was in a really good place spiritually and was growing in her relationship with the Lord. A few months later, she started dating a guy she had recently met. She became convicted because she had begun to idolize this relationship, putting him in the place of God. Sorrow described that seeing the contrast of both her season of intimacy with the Lord and the period of placing something else in God’s place led her to write. This helped her wrestle through some of the lessons the Lord was teaching her during this significant time of her life. Sorrow explained that through telling her own story of learning to trust the Lord, this book seeks to encourage others to find fullness in Christ as well. Towards the end of her high school career, Sorrow took a break from her writing in the midst of graduation and transitioning. She picked up writing again last fall, even during her freshman chemistry class. She realized again how much she enjoyed writing and that she has experienced struggles she believes other people can relate to. Sorrow already has found joy in rereading this testament to God’s faithfulness to her as she goes back to proofread and finish this book before it is available on Amazon in December. Writing and reading her own work has encouraged her to pursue God wholeheartedly, and Sorrow hopes that this book will encourage others to do the same.